I bought an old house 10 years ago and, adhering to the advice of Tom Silva, focused any renovation or improvement work on securing the home from water and improving the mechanicals. It was prudent advice but it inferred that some of the more visually gratifying renovation projects were put off and as a result, we got accustomed to some less-than-ideal furnishings and, frankly, some ugly rooms. After years of the aforementioned prudent renovations, it is finally time to fix some of the things that we can appreciate! It’s always a little random when I decide to fix something and this was no exception. 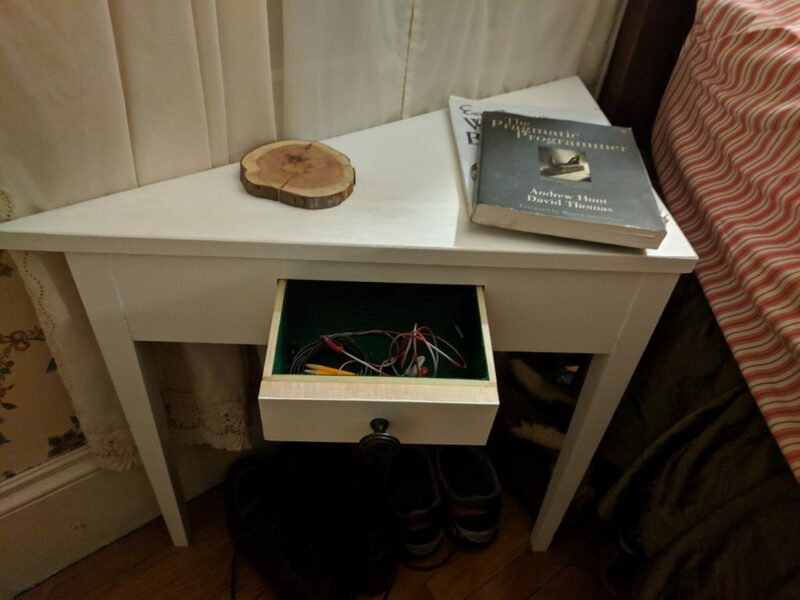 Let’s start with the problem: I don’t have a nightstand. So I didn’t have a nice place to charge my phone and store incidentals like books and headphones or a cup of tea. There are lots of nightstands available on the market but the wall behind my bed is shaped like this \_____/ so I needed an odd-shaped table. Since I needed a custom solution, I had the opportunity to make it special and did not hold back in this project, opting for an integrated USB charging hub tucked in the back! One element to my advantage is that three-legged objects never tip or rock. I used “found” materials for the project — ended up building the whole thing using parts from discarded furniture that I collected over the years. The wood does not match (there are parts made from maple, oak and poplar) but it is painted so that doesn’t matter. The legs were joined to the apron using mortise and tenon joinery. One of my favorite touches, from a woodworking perspective was adding a gentle taper to the legs. They are 5/4″ square at the top and 3/4″ square at the bottom.